Depart every day (except Tuesdays and Thursdays) at 9 am. Participants should be at the meeting point by 8.45. Returns to Munich at 18.30 (wintertime) ad 19.00 (summertime). Visit in the winter to see the magnificent castle coated with snow or in the summer to explore the forest walking trails. We are comparing Neuschwanstein Castle Full-Day Tour Prices from leading ticket suppliers and Try to find you Cheap tickets prices on the market. The ‘mad' King Ludwig II greatest blunder but one of Germany's most impressive constructions, the Neuschwanstein Castle was built in the 19th century, perched between mountain peaks at the edge of a grand gorge. On this full day execution from Munich you will travel with an expert bilingual guide to the historic town of Fussen. The 2-hour train journey will take you from the bust city centre into the heart of the Bavarian Alps so be sure to charge your camera for this trip. As you walk uphill to the castle entrance your guide will fill you in on the facts and myths behind the castle and the ‘mad' king who ordered its construction. You'll have the option to take a 45-minute tour of the interior (own expense) or exploring the surrounding area, there some pleasant walking trials to the gorge and Pollath Waterfall and plenty of Beer Garden's where you can sample the local produce. Before returning by train to Munich you will also enjoy views of the Hohenschwangau Castle and Marienbruke Bridge. Ideal for visitors who would like to visit the Neuschwanstein Castle and get a taste of the Bavarian Alps without the hassle of arranging their own transport. Both nature lovers and historians can enjoy this unique day tour, you will travel through mountain scenery while learning the history of the region. Best for adults, small groups or individuals. May be strenuous for people with walking difficulties. Your Experience With Neuschwanstein Castle Full-Day Tour? Travel from the centre of Munich into the Bavarian Alps to visit the dream-like Neuschwanstein Castle. Travel stress-free in the company of a professional local guide and benefit from the small group size. Hear stories of the castles construction, the history of the region and the myths surrounding King Ludwig II. Enjoy majestic views and have the option to see inside the castle or explore the surrounding grounds. What Neuschwanstein Castle Full-Day Tour Includes? Return transport by public train from Central Munich. Munich Central Station to Fussen by train – visit Neuschwanstein Castle or surrounding area – Return to Munich by train. If you would like to visit the interior of Neuschwanstein Castle you can save some time with a skip the line entrance ticket, you can select this option when making an online booking with Viator. 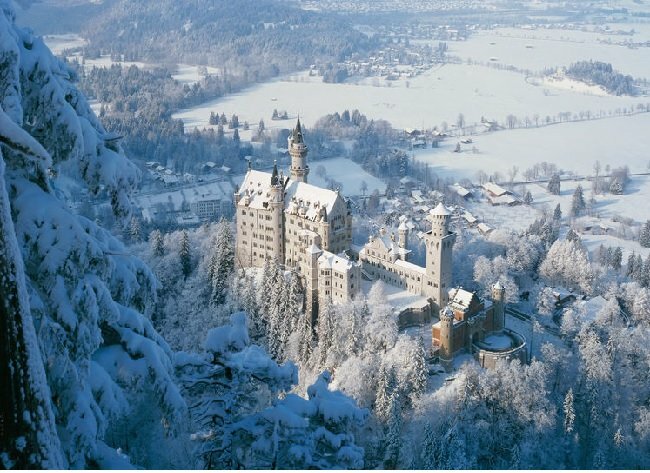 Travelers Reviews about Neuschwanstein Castle Full-Day Tour? The Neuschwanstein full-day tour from Munich has earned over 1,700 reviews and a 4.5-star rating on TripAdvisor. Travellers agree that the tour is informative, well organised and well worth the journey. Some comments complain that you are not permitted to take photos inside the castle, this is not the responsibility of the tour provider, and that entrance to the castle is not included. Please bring your E-ticket or printed ticket. Tickets are fully refundable up to 24 hours in advance if your ticket was purchased from Get Your Guide, or up to 7 days in advance if your ticket was purchased from Viator. Please dress appropriately for the weather and bring comfortable walking shoes, there is a large hill to climb in order to reach the entrance of Neuschwanstein, this will take approximately 20 minutes. If you do not want to walk to the entrance you will have the option to take a bus or horse and carriage most of the way up the hill, the cost of this is not included in the ticket price. Entrance to the castle is not included, the cost is €12.